Who is it for? 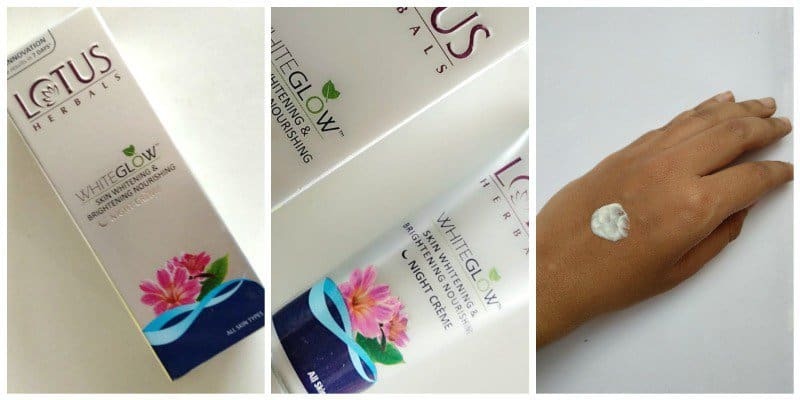 Lotus White Glow Night Cream is for all those who always remain in search of a night cream that lightens, brightens and whitens skin overnight. It enhances skin radiance and improves skin tone. It contains mulberry extract, grape extract, and Saxifraga extract. It comes in a silvery grey tube packed in a box of the same color. Quite a sturdy packaging. The texture of the cream is neither very thick nor very runny, just perfect as it should be. Very nongreasy it and lightweight texture. Gets easily absorbed in the skin and little quantity resembling almost of pea size is sufficient. It has mild sweet fruity fragrance almost resembling mulberry . My experience with this cream is quite good. Just one application and my skin feel hydrated all day long. It heels skin in the winter season and makes skin soft and supple. I apply it every day before my sleep. Every morning I wake up with refreshed and glowing skin. But I don’t feel it can help you making fair. It does lighten acne marks but ain’t remove them completely. All over I feel except related to pigmentation, it does everything that it is expected to do. It definitely makes skin healthy revealing that natural glow. I never felt any sort of itchiness or dryness after using this. It’s definitely great as a night cream, don’t expect much of whitening. Yes, I would recommend you to try this as it’s a great product to maintain skin integrity and health. It is quite effective in revealing natural glow. Except whitening, its great as a night cream. Thankuu so much simran…do try this !! I have used this range products.. The day cream somehow didn’t suit and gave irritated skin.. haven’t tried this night cream though..
Lots of my friends use this.. They say this range products show tan removal actions but take at least 4-5 months of regular use to show visible result..